Ed Gillespie, the Republican nominee for governor of Virginia, and his lobbying firm Quinn Gillespie and Associates were paid millions of dollars to represent the Republik Srpska and its OFAC listed President Milorad Dodik. 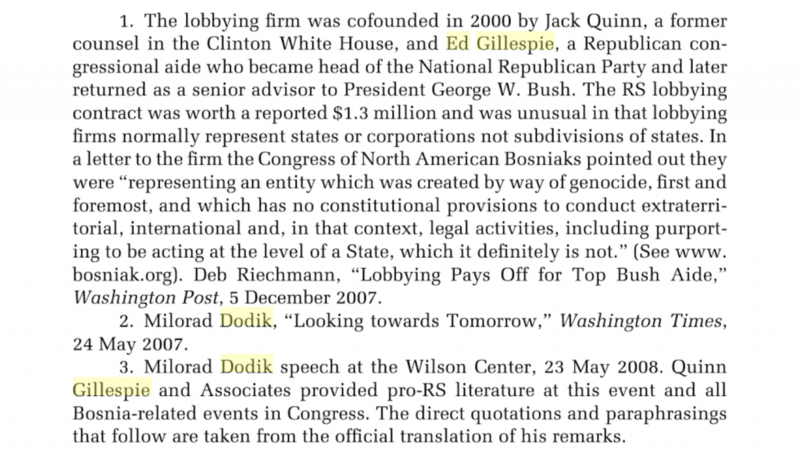 In a stunning series of revelations, Ed Gillespie, the Republican nominee for governor of Virginia, and his lobbying firm Quinn Gillespie and Associates were paid millions of dollars to represent the Republik Srpska and its OFAC listed President Milorad Dodik. The one thing that is clear here is that Ed Gillespie supported a foreign government built on ethnic cleansing and genocide. It is very clear from these documents that the firm was paid millions of dollars to push out false narratives about the Serbian conflict to line his pockets while hundreds of thousands of innocent people were murdered. Calls to the campaign to query them on these revelations went unanswered by press time. We will update more on this developing story. Ed Gillespie, like Paul Manafort, sold his soul to a ruthless dictator who loves Russia but hates America, NATO and Europe. Gillespie’s lobbying firm was paid almost 6 million dollars to represent the interests of the Republika Srpska and its ruthless President Milorad Dodik. The US Treasury Department under both the Obama and Trump administrations imposed sanctions against Dodik for “actively obstructing the “Dayton Peace Accords” by calling for secession and supporting convicted Bosnian war criminals who directed the slaughter of 100,000 innocents. Those war criminals were charged with Genocide, Religious Persecution, Crimes Against Humanity, Extermination, Murder, Deportation, Inhumane Acts, Spreading of Terror, Hostage Taking, and Illegal Attacks on Civilians. Despite these extreme sanctions, Dodik sought the help of Ed Gillespie to secure a visa to attend the inauguration of Donald Trump, but even that was denied because Dodik is such an abomination. But Gillespie was successful in setting up conferences for Dodik, issuing press releases bragging about his relationship with Dodik, and publishing Dodik propaganda after he trashed America and NATO, and threatened the stability of the Balkans despite a heartbreaking war and the death of tens of thousands of women and children. Ed Gillespie’s palling around with Dodik and accepting millions to sanitize and sugarcoat his God-awful behavior clearly shows that Gillespie has no morality or ethics. He sold his influence to the worst of the worst. These are the stories that Ed Gillespie ignored while he raked in millions. A vote for him would be a reward for his dishonor of all those who died and suffered in a war supported by Milorad Dodik. It would reward him for his years of undermining the security interests of America and its allies. Virginians do not reward evil, and should not do so on November 7th. This is a developing story and there is much more that will be added to it in the coming days.